Snuggie Blankets brought you the comfortable and cozy Blanket with Sleeves. Now bring that same comfort home to your dog! Dogs will love the soft fleece blankets and you’ll love their great look! 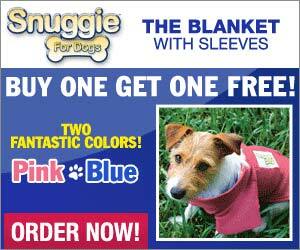 Snuggie for Dogs are offered in pretty Pink and stylish Blue blankets! Get one today and they’ll also include the Recordable Dog Tag absolutely FREE! Take advantage of this special offer today! Buy 1 today and get another 1 for FREE plus you’ll get a recordable dog tag! The Recordable Dog Tag is a customizable way to ensure your dog makes it home safely everyday. Simply press the Record button and voice record up to 10 seconds of your safety information. If you should make a mistake, simple repeat the process, and re-record!